Mankading controversy was the hot topic in the first week of Indian Premier League 2019 (IPL 2019). Ravi Ashwin during Rajasthan Royals (RR) vs Kings XI Punjab (KXIP) mankaded Jos Buttler and since then cricket experts have been arguing whether the controversial dismissal is against the "spirit of the game” or not. Meanwhile, during the Mumbai Indians (MI) vs Chennai Super Kings (CSK) match, it appeared Krunal Pandya gave mankading warning to CSK skipper Dhoni. MI vs CSK Stat Highlights IPL 2019: Mumbai Indians Becomes First Team to Win 100 Matches in Indian Premier League. Pandya while bowling pulled out of the delivery. However, Dhoni’s bat was well inside the crease at the non-striker’s end and Pandya’s any intention to Mankad Dhoni or issue a warning was all in vain. Interestingly, this was the second time Pandya was looking to give a mankading warning. During Mumbai’s game against Kings XI Punjab Pandya clearly gave Mayank Agarwal a mankading warning. 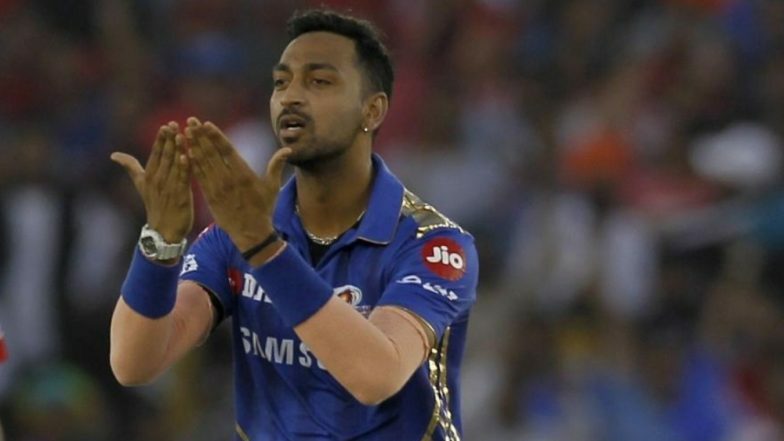 Krunal Pandya Tries to Pull off R Ashwin, Attempts Mankading Mayank Agarwal During KXIP vs MI, IPL 2019 Match (Watch Video). Meanwhile, Chennai Super Kings were handed season’s first defeat by Mumbai Indians at the Wankhede Stadium. Batting first, MI set CSK a target of 171 runs and then the visitors found it tough to chase down. IPL 2019: Yuvraj Singh Blocking Ishan Kishan’s Place in Mumbai Indians Team. Mumbai’s 37-run win was their first at home this season. Super Kings now have three wins from fours matches while Mumbai have two wins out of four matches in their kitty.